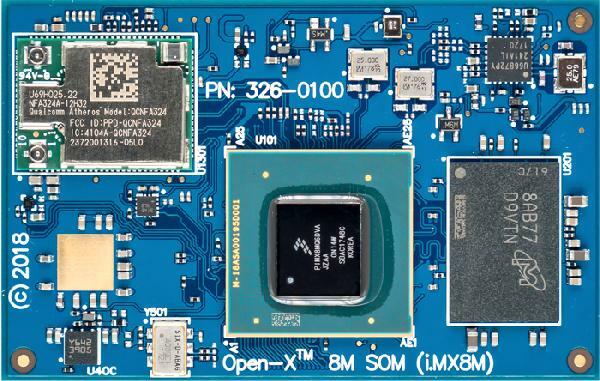 Connect Tech Inc’s V7G System, which is also listed as the “COM Express Type 7 + GPU Embedded System”, is the first Xeon-D based SBC-like product. The V7G houses a 5th Gen “Broadwell” Xeon-D based COM Express Type 7 module and it can house three Nvidia Pascal-driven graphics boards. No OS support was listed yet, but it is expected to work with Linux or Windows. This 216 x 164mm footprint system can drive 4x independent display outputs. Alternatively, it could also be used for headless GPGPU CUDA processing for Deep Learning and Artificial Intelligence applications. The V7G is the successor to its earlier, Xeon-E3 and Type 6-based “COM Express + GPU Embedded System”, which similarly offers the choice of Nvidia Quadro P3000 and P5000 boards. Instead of the V7G’s new Nvidia Tesla P6 option, the earlier model offers Nvidia Tesla M6 and GeForce GTX 1080 or 1050Ti graphics options. The V7G combines 10GbE and HDMI support, as well as new mini-PCIe and M.2 expansion slots. The user can choose from a 12-core, 1.5GHz Xeon-D1559 or a 16-core, 1.3GHz Xeon-D1577, both with 45W TDP CPUs for the module. The module also comes with up to 48GB DDR4 (2400MT/s) ECC RAM. Both the 100W Quadro P5000 and more recent, 90W Tesla P6 (PDF) offer 2048 CUDA cores. The Quadro P3000, which launched last year, is limited to 1280 CUDA cores but has a lower power consumption of 75W. The Tesla P6 is a GPU accelerator optimized for blade servers and designed originally for deep learning, visualization, and virtualization. As a drawback of this, the Tesla P6 equipped version of the V7G board lacks HDMI ports. Storage department includes dual SATA interfaces and dual M.2 M-Key with the support of NVMe. The board implements 4x GbE and 2x 10GbE ports. The design is said to support a future upgrade path to 4x 10GbE ports. There are also eight USB port, 4x USB 3.0 and 4x USB 2.0 ports, a micro-USB console port, and 8-bit GPIO. For expansion, there are dual mini-PCIe slots and two more M.2 slots with PCIe expansion. A heat spreader is included but the fan is optional.